VIEW THE WORLD THROUGH MY EYE GLASS: It's been a long time; 6 days to ColdPlay! 9 Days to Sydney! It's been a long time; 6 days to ColdPlay! 9 Days to Sydney! Many things happened. 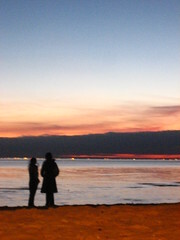 Went to city and Brighton Beach again with Ling² and Wan Sze with MJ, Jas and Terrance. Went to Smith street for factory outlet again, didn't buy anything as my thrifthy self. Wan bought another jacket for William, that girls spends a lot on him. We reached Brighton Beach just b4 sunset. Sorry to Ling and Wan Sze and Jas who haven't been there to see the beach at almost night time. But i had a good time taking all the photos with Ling's camera. If only i had my tripod with me... Browse the photos, they're not bad. Well soon it was left with Jas, MJ and I. 3 people 相依为命。 We cooked like we never cooked b4. Item's on the menu include curry fish head with fish body... Shepard's Pie, Oysters, Sambal Long bean, Emperor Chicken (like 药材鸡) Laksa Yong Tao Hu. Work work work. Shagged. That's all i can describe bout it. Mark GCE, GCSE scripts by stare at the blardy screen for 7½ hours a day. Last week work on Saturday 8 to 1 somemore. But pay coming in 2 days! Can at least see some money rolling in. Well at least there's Kary, Amy, Daryl Cheng, MJ JAs Jonathan Tan to keep me company at work. Soccer: I like watching soccer, i dun play much, but i think my pre-premidlifecrisis alzheimer's is kicking in, affecting my hearing and occasionally sight. Jasmine and MJ can vouch for my recent hard of hearing. Time to syringe the ear, and break a tympanic membrane or 2. But you are deaf with your sorrow, blinded from the world by your mask. Why do you put yourself through this immense pain by yourself. A wet shoulder, A friend's ear full of your saliva, saves the day, it ain't that bad to share, is it?